Castillo de Pinar Gift Bundles make the perfect gift for the foodie or health enthusiast in your life. Castillo de Pinar Olive Oils are the highest quality, most flavorful olive oils in the world. 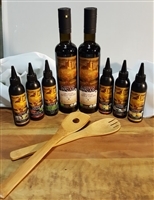 These organic oils, along with Castillo de Pinar Balsamic Reductions and Peri Peri Finishing Sauces, heighten the flavor of meals and show you care – all in one savory bundle. Give the Gift of Taste today. Each package includes food pairing ideas and will be gift wrapped appropriately for the occasion, then shipped securely in an outer box. All Christmas orders must be placed and shipped by December 15. Castillo de Pinar Organic Extra Virgin Olive Oils are produced using these ancient olive farming, harvesting and processing techniques. This heritage combined with the most desired olives and our time-honored approach yield the highest quality, most flavorful olive oils in the world. Our Organic Extra Virgin Olive Oils are 100% Picual olives and are sought after by chefs because of the high amount of polyphenols and antioxidants. 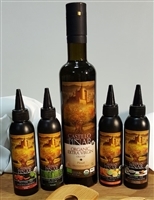 Castillo de Piñar USDA certified Organic Balsamic Reduction Vinegars are created by blending carefully selected grapes from the Modena region of Italy, maturing and fermenting in oak and chestnut casks, reduced in South Africa with organic cane sugar, organic produce, and spices. Castillo de Piñar Peri-Peri Finishing Sauces are created by blending carefully select South African Pili-Pili Peppers, Jalapenos, Habaneros, then mixing together with spices, vinegar, and produce to create a sweet but spicy flavor.